The City sedan has been Honda’s most successful car in India till date and is now in its fourth generation in the country. The car has received its customary mid-life update in 2017 and with the added equipment looks forward to regain its top spot in terms of C-segment sedan sales. This is a midlife update and hence the changes are largely cosmetic. On the outside, this facelifted Honda City gets a new fascia which matches the latest design philosophy of the Japanese automaker. The bumpers too are new and give the car a sporty appeal. Move over to the side and its familiar City fare with the exception being a new design for the alloy wheels. This new design is the diamond cut variety and for the Indian market is likely to be optional alongside the current design. 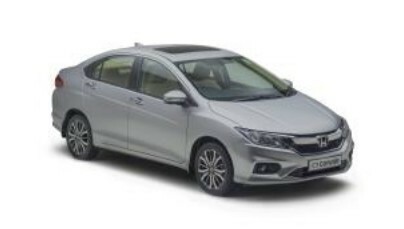 The new Honda City continues with the popular beige and black interior. The top-spec ZX trim is the only one to get the LED DRLs and 16 inch alloy wheels along with a 7 inch touchscreen system with Apple Car play standard. The lower variants get 15 inch alloys and a touchscreen replete with Bluetooth telephony and AUX and USB inputs. It continues to get an electrically operated sunroof, electric wing mirrors, automatic climate control and other bells and whistles from the older car along with the push-button start. The ZX also gets rain-sensing wipers and auto on/off headlamps. On the engine front, this facelifted City will continue with the 1.5-litre petrol and 1.5-litre diesel. The former produces 119bhp/145Nm while the diesel produces 99bhp/200Nm. While the petrol comes with a five-speed manual and automatic CVT gearbox options, the diesel mill comes mated to a six-speed manual gearbox. In terms of safety, the City is expected to get dual airbags and ABS as standard across the range and the ZX trim gets six airbags. This is an important car for Honda as it one of the models that helps them in the volume game. It will take on the likes of the Hyundai Verna, Maruti Suzuki Ciaz, Nissan Sunny and the Renault Scala. It is also their competitor for vehicles like the Renault Duster, Nissan Terrano and the Hyundai Creta.